We are on Maui at a very special time. This weekend workshop with John Friend coordinated with the 40th Anniversary of the book “Be Here Now” by Ram Dass. At the end of each day of asana practice, we get the privilege of sitting with Ram Dass to hear his story. John had started our asana practice with a talk about positioning ourselves to receive Grace. That nothing is random, he said, but maybe we just can’t see the beginning and the end because it is across such a long thread of time. Think about the last ten years…what were the highlights? What were the things that gave you big openings? What brought you here today to be on this mat in Maui? It was really crazy to think about. I thought about how ten years ago my dad died. I was barely doing yoga. I started doing yoga from money he left me. I started in Ashtanga and then almost stopped practising all together until I met Christina Sell.That was significant. I met John 4 years ago in Maui- here I am 4 years later , in the certification process, with my mat in front of him in the front row. 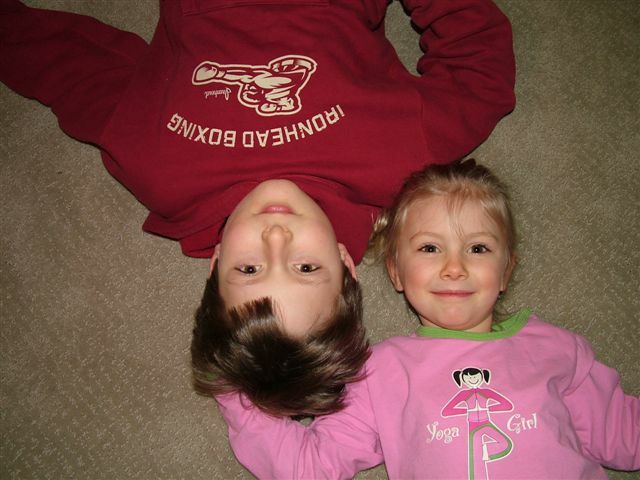 Wow- I have come a long way…….. I can see the thread very distinctly now. Nothing seems crazy or random- it just seems…well...right. Like the right in that deepest knowing inside of yourself – my soul knows what my mind can barely conceive. How wonderful! Of course, to top this all off, John dropped me back into a backbend. There is no way 4 years ago it would have looked anything like what it looked like today. It just felt so good and so right- no fear, no discomfort – just the deep knowing that I am where I am supposed to be...right here….right now. When we started satsang with Ram Dass in the afternoon it was wonderful to see the love between the two of them. Ram Dass speaks slowly because of his stroke but John creates such a beautiful space for Ram Dass to take his time and chose his words. Ram Dass asked us I we were all Shavaites ( followers of Shiva) , he said he had been a Buddhist when he met Maharaji ( Neem Karoli Baba) who was a Vishnuvite ( follower of Vishnu) but he said the most important thing was that we could all come together as lovers of God. “God is Krishna, God is Buddha, God is Us.” I will never forget that quote. He then introduced his talk by saying, ” So how did “Be Here Now” get here now?” For those of you that have not met Ram Dass, he has an incredible sense of humour. He had us laughing a few times during the talk. Ram Dass told us of his journey to India and how he finally wound up meeting Maharaji ( I will leave you to read that in the intro of Be Here Now). What was new to me is how he explained he wrote the book during his “miracle stage”, the stage where he was still entranced with Maharaji’s ability to read his mind and know his secrets. He said he missed, at first, the real power of Maharaji, which was his unconditional love. From there, he told us the story of the book. You see Ram Dass didn’t plan on writing a book. His teacher, Hari Dass , told him that Maharaji had given Ram Dass his ” asherbad” ( blessing) for his book. ” What book? ?” thought Ram Dass. ” I guess I am supposed to write a book….” So upon his return to New York, Ram Dass wrote a book on travelling in India. No publishers would take it. Hmmm, he thought, guess that must not be “the” book! Shortly after that, in New York, one of the group who had always gathered to hear him lecture gave him a stack of papers. “What is this?” he asked. “It’s your words. ” the woman said. She was a stenographer and she had been writing notes of every lecture. Ram Dass threw the notes into a box in the back of his car and drove out to see friends. When he got to his friend John’s place, John was getting his suitcase out for him and saw the box. ” What’s that?” he asked. ” It’s my words.” said Ram Dass. ” Can I see it?” he asked. ” I have marked all the relevant stuff”. Ram Dass then threw them back in the trunk of the car and drove to a commune called the Lama Foundation near Taos. While helping him with his bags, another friend, Steve, saw the box. ” Oh- it’s my words, ” said Ram Dass. “Can I see it?” Steve asked. Well at the Lama Foundation there was very little money but lots of creative people. As they sat with “the words” , five artists there decide to make pictures with the words. Slowly and surely, ” What’s that? ?” was becoming a book. A book with Maharaji’s blessing in it. The group of them were then trying to figure out who would want such a book about spirituality and Oneness etc. Not maybe such a hot topic in 1970, so they decided that everyone who came to Ram Dass’ lectures would receive, for their $1 entry fee ( seriously? A buck??? ), the lecture and the book. But at that time the book was actually a paper box. The box contained: a book called “our story” now the intro to Be Here Now, a cookbook (! 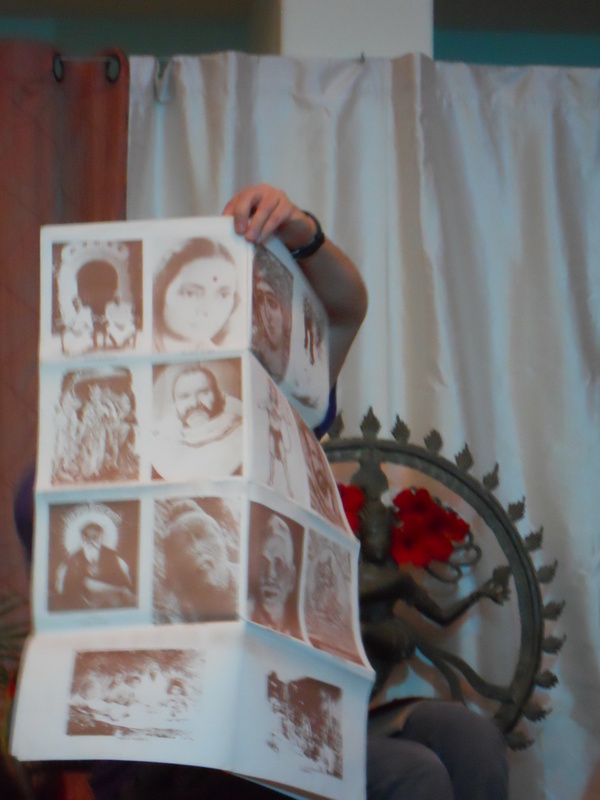 ), a record, a large paper with quotes you could cut out and ” put on your fridge” as Ram Dass put it, another large paper with pictures of the Gods and Saints, and of course- the book-made of brown paper that looked like grocery bags and hand bound. Ram Dass jokingly called it “ the do it yourself kit”. 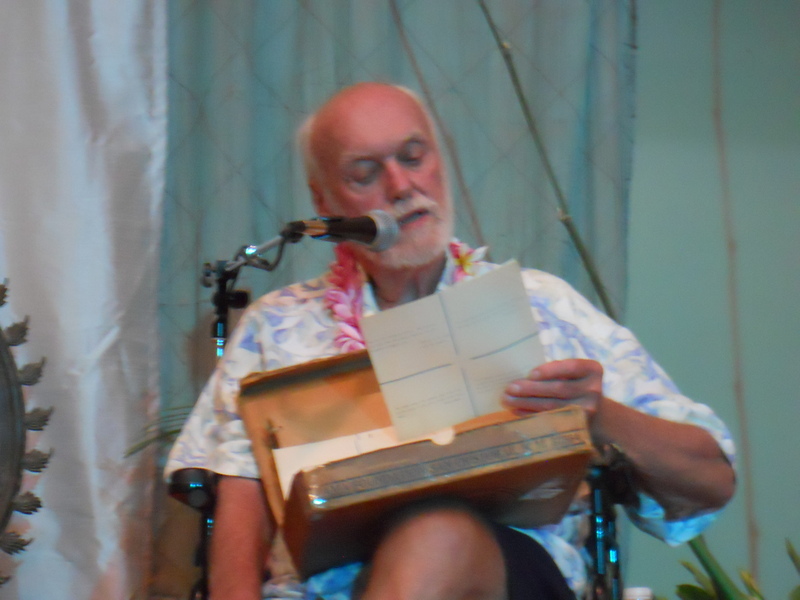 Ram Dass brought a bag up on his lap and John Friend, assisting him with much reverence, pulled out one of the original boxes containing Be Here Now. It was so amazing. Apparently 1000 copies were made. I have no idea how many are still in existence. Out came all the little books and posters and quotes you could cut up and post- John held them up and we all marvelled at the humble beginnings of a book that has now sold 2 million copies. Ram Dass ran off to telegram Steve in Taos to stop the printing and fix the error. Steve said that the printing was already on the press- it was too late. Going back to the hotel there was a letter for Ram Dass from Steve. One of the printing blocks was missing- they were missing a whole page of the book and couldn’t even locate the original. They could not print the book….. They fixed the mistake and the book went into it’s second printing. We ended the day by Ram Dass talking about the miracle stage and the love stage. For Maharaji’s greatest power was his ability to unconditionally love. Ram Dass explained in the West we identify with our “roles” and in the Himalayas they identified with their “souls”. In Anusara, all of us have a “soul role”. Those two words sunk so deep, and rung with such truth, that it could become my mantra. In honour of that unconditional love and 40 years later being able to see the greater message, Ram Dass pulled from his bag his brand new book, not even yet released, ” Be Love Now”. In front of all of us , John Friend became a recipient of one of the first copies. The official release will be November 2, 2010. Ram Dass left us with a last thought to ponder. The theme of day three, the last day of the intensive, was ” Faith, Devotion and Grace”. We covered the last 6 chapters of the Gita- except for chapter 15. (Don’t ask) It was really the emphasis of the Bhakti path or devotional path of yoga which was contained in the last chapters of the Gita. The Bhakti path is not really unfamiliar to us in the West as the worship of Christ is a bhakti path. Many people worship God but the figure of Christ as the embodiment of God and his attributes makes it easier for us to understand than the disembodied divine spirit. As we are manifested in physical form it is hard for us to understand and conceive that which is beyond form and so we take manifested objects and our love for them is what triggers our love and understanding of the universal. We need form or a name in order to have that opening. I often think of my Dad that is no longer alive and my love for him takes me straight into that place where abstract thought cannot take me. My love for him teaches me about devotion. 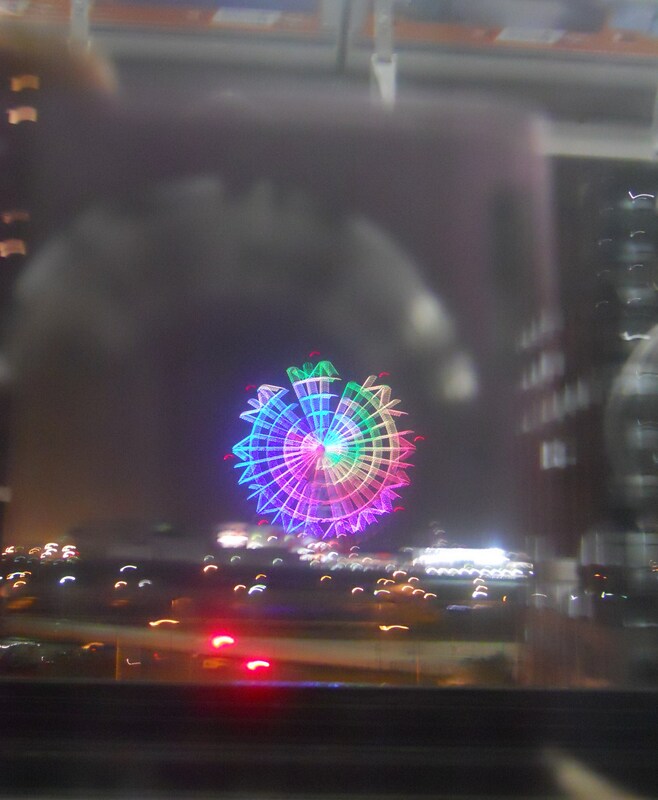 It takes the absolute realm of the universal and manifests it into something that I can understand. Love is in relationship. You need to love something to understand love- you can’t understand love from a book or from a lecture- it is experienced in relationship. John asked us all to write down what was the secret of the Gita that Krishna gave to Arjuna- the highest teaching. This is what I wrote, ” That God is in everything and everything is in us. Knowing this, live skillfully with love in your heart”. It is amazing that it takes 18 chapters to get that but you know how we are…..Arjuna keeps asking and doubting and Krishna has to keep explaining and going into more detail….I am wondering if Krishna was a wife….hmm. We had a rockin’ practice of love in the morning which culminated in hand stand drop over to urdva dhanurasana. I know we did some other cool stuff like a dwi pada with an assist that had our foot in our partner’s back-( I actually adjusted Sjanie’s spine…. *pop* ) but we were so blissed out that I forgot. I practiced right beside the Hanuman banner and Maharaji’s picture and it was like Maharaji and the monkey were really digging our practice. Ram Dass came back for the afternoon and I got brazen enough to ask him to sign my book. As I walked into the room he was in I signaled a bewildered Sjanie and had her grab her book. This is not something Sjanie would normally do, so I kind of cajoled her into it, but I don’t hesitate to say she has no regrets. Ram Dass was very sweet to us and I told him how my daughter loves the monkey ever since we had Satsang with him. He was very pleased about that. Sjanie and I returned to the yoga room with our books clutched to our chests and a little misty trying to soak up Maharaji’s shakti and lookin’ like we just had our favorite movie star autograph our book. 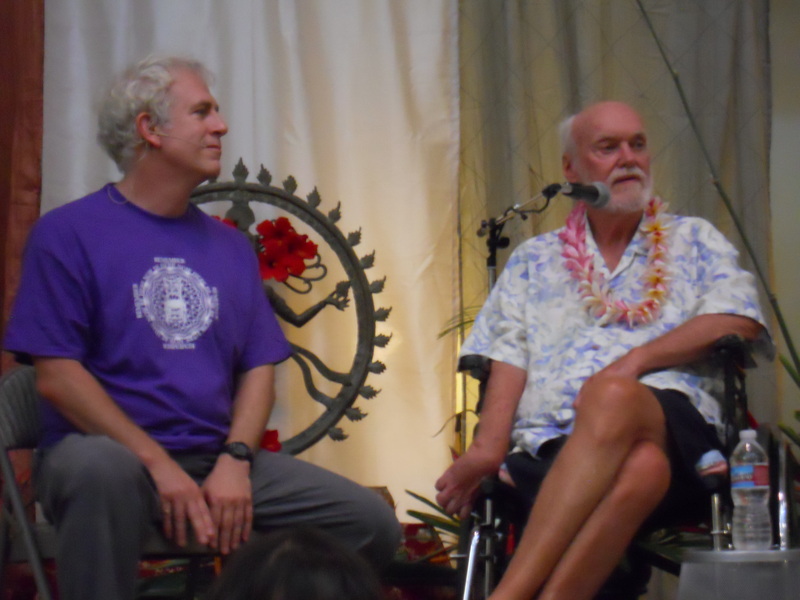 Yup- yoga geeks…..
Ram Dass gave the most uplifting and warm talk and he spoke for two hours. He talked about his stroke which was very moving. He said it was like his chapter 11 in the Gita when Krishna reveals himself in the universal form. Before that Arjuna didn’t have faith- he had belief ( which comes from the mind) but he didn’t have faith ( which comes from the heart. When he has his stroke he said he lost faith- he said to Maharaji, ” Hey- did you go out for lunch??? What is THIS?” He was completely depressed in the hospital and he stared at the picture of Maharaji on the wall. People would come in and say ” How could Maharaji let this happen to you”. It was ” all very sad” he said. Over time though he started to realize that the stroke wasn’t from Maharaji- it was from nature. It was his karma. His abilities that he was left with were Maharaji’s Grace. It was fierce Grace, but still Grace. Because Ram Dass had slowed down his audience had to slow down too. His wheel chair and paralysis softened people to him and he was better able to open their hearts. These positive things Maharaji supplied. Maharaji used to say to him, ” I love suffering- it brings me so close to God”. That’s not saying that suffering is optimal, but isn’t it usually in our darkest times we seek out answers? Ram Dass explained that devotion cannot be done by intellect. It is done by the heart. A devotee is one whose heart has been opened. He explained that he loved Maharaji and was his devotee but what he really loved was the God within Maharaji. You cannot fall in love with the God in you, your atman, but you can fall in love with the God in someone else. John had a great quote that went, “ When I don’t know who I am I serve you- when I know who I am I am you.” It really summerizes the path of the bhakti yogi. Maharaji used to tell Ram Dass to meditate like Christ. ” Lose yourself in love” he would say. This puzzled Ram Dass so Maharaji showed him and, as Maharaji meditated, tears rolled down his face. 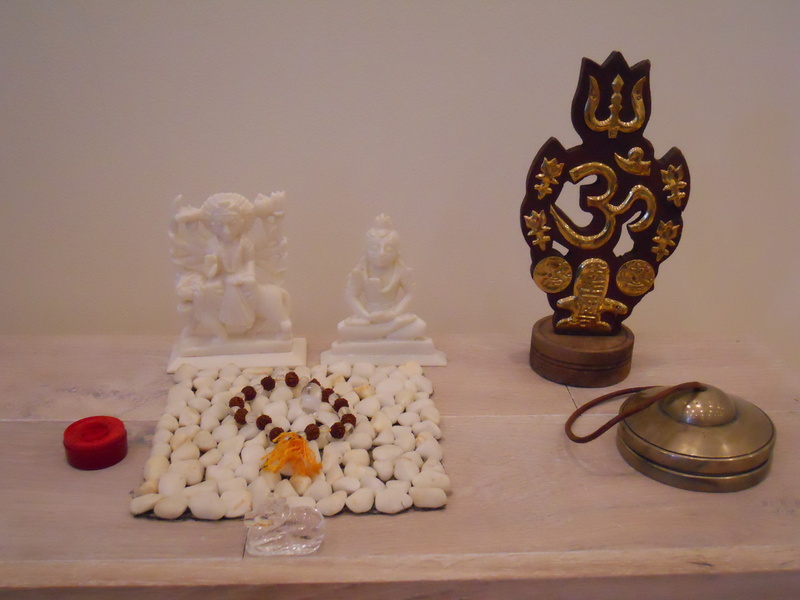 Meditation can become like a ritual that is empty of love- this is what Maharaji was trying to explain. Ram Dass said, “You can sing hymns like you are reading the shopping list- but these are the beautiful words of Christ- you need to sing with love”. Ram Dass’ name means servant of God. It also is another name for Hanuman. This segued into Ram Dass giving us a mini synopsis of the Ramayana. He kept saying he was talking too much and apologizing and we were all ” NO- please, please continue.” His assistant said he hasn’t talked that long to a group since his stroke. His assistant figured our attentiveness was feeding his desire to share. It was so very special. Ram Dass finished his time with us by telling us his mantra- “ I am loving awareness“. John sweetly gifted a shawl made from cashmere to Ram Dass and wrapped it around his shoulders. It was so obvious to us that it was like Maharaji’s famous blankets. It all just seemed so right. The perfect way to thank him and honour our time together. After Ram Dass left, John took the mantra Ram Dass told us and we used that as our japamala mantra for the afternoon. We also turned our mats and faced one person who we did a meditation and a partner exercise with. We had to look at them and tell them what we liked about them~ what we saw. It was fun and brought back memories of doing that with Christina Sell many years ago. We ended the whole day by making a huge circle and taking the whole three days and summarizing it into a few words or a phrase. We went around the circle saying our personal summary. There were some classics. Some of my favorites were, ” Be the loving dude I actually am” ” Love everybody” ” love makes us one” ” Hare Krishna” “Hare Ram” ( back to back no less… ) and “Yum, yum, yum” which is what Ram Dass would say every time he talked about getting to that deepest part of your soul.